Each week the PC Gamer team takes a break from hunting monsters and starts hunting hot takes. 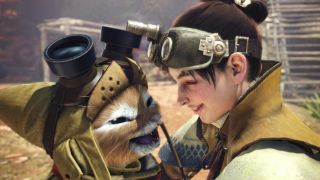 Monster Hunter: World is out on PC is just under two weeks and the wait had been killing me. Yesterday we got our hands on pre-release code and I tentatively jumped in, bracing myself for the worst. But, barring a few hiccups, Monster Hunter: World is looking like a rock solid PC port. On my modest 970 I'm clearing an acceptable 50 fps using the 'high' graphics preset, so I need to wiggle some individual settings a bit but overall I'm very happy. The controls are pretty good on mouse and keyboard too, which is great because aiming with the bow is much more intuitive with a mouse. As long as there's no unforeseen disasters between now and its launch on August 9, I think Monster Hunter: World will be a hit. I can't wait to play it with all my PC friends. You know what, I might actually play some Warframe this weekend. I tried it close to launch years ago and it felt like a bit of a cheap grind that I couldn’t muster the patience for. Now I gather it’s still a grind, but a huge, absorbing grind with its own weird personality. As a Destiny-liker (I know) I should have a high tolerance for space-weirdness, but the Warframe’s chitinous armour and MDK vibes leave me frightened and intrigued—unusual for a shooter looter. Yes, I’m going in. I may emerge on Monday a changed man, full of strange knowledge about bits of esoteric space armour. I blasted back off into No Man's Sky this week with the arrival of Next. It's still not the game I and many others had originally hoped, but each expansion has given players more ways to experience it, and it looks and sounds even better than it already did (even on very sad planets). I think if you played it back at its original launch and were disappointed, you should jump back in and try it again. If the deeper crafting system isn't your thing, skip it and explore in Creative Mode for a hassle-free experience. Even just having the option for third-person perspective gives it a brand new feeling, and it's easy to join up with friends for some co-op. Who knows what you'll see? After Metal Gear Survive arrived to a reception so muted I almost forgot it came out this year, it was hard to figure out if anything Metal Gear-related was even on the cards in future. Then came this surprise update to the game, allowing players to take on the role of Quiet (whose character design only raises more eyebrows in 2018 to be honest). I like the idea that MGS5 is still getting these small changes almost three years after release. Presumably they wouldn't bother unless a significant number of people were still playing the game. As I write this, 2777 players are playing MGS5 according to Steam Charts, versus just 81 for Survive. GTA Online launched its After Hours nightclub update this week. I’ve had a busy one in real life, which means I’ve only played around two to three hours—and I’ve spent at least half of that dancing in my pretend club to a pretend version of a real DJ. World-renowned spinner (am I too old to use the word ‘spinner’? Almost certainly) Solomun is this week’s resident, and his set is absolutely banging. Check out Samuel and I getting down on the floor to his tunes here. Tale of Us enter the fold on Tuesday, followed by Dixon the following week, followed by The Black Madonna the week after that. As a long-serving techno head, I’m really, really enjoying myself. Even if running a successful business is a shade boring. I guess it's a bit weird to call a deal on speakers my high of the week, but it's been a very medium week, and these refurbished Harman Kardon Soundsticks are $100 off, which is a great deal. I've been using an older version of the Soundsticks for years now, and I love them. They're stylish, they sound great, and they include Bluetooth connectivity if you want to play music from your phone and not your PC for some reason. There are obviously better-sounding speakers out there, but for this price I wholeheartedly recommend 'em. If you happen to be shopping around for a new set, here are some of our other favorite PC speakers (plus more on the Soundsticks).